I subscribe to Yahoo!’s Ask Yahoo! daily e-mail newsletter. 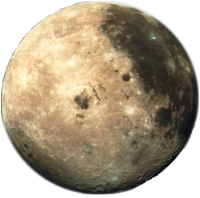 Yesterday’s question was, “Does our moon have a name other than ‘the moon’?” In short the answer is no. We like the moon, and we like to name things we like, such as my kids, Jonah and Archer, and my car, the Nimble Imp. So let’s name the moon. And let’s give it a name that will stand the test of time. In thirty thousand years, when spacefaring humans rediscover a long-abandoned Earth, they’ll hardly be inclined to call our moon “the moon”; it’ll be just one of millions they will have catalogued. If we don’t want our distant descendants calling it something like “SZCG-78513/12,” it’s up to us to give it a memorable name that will survive into editions of the future Encyclopedia Galactica. Next PostNext Mixture or mixture?